On July 24, 2016, 21:00 UTC, it was 98.7°F or 37.1°C at the green circle on above image. Because humidity at the time was 72% and wind speed was 2 mph or 3 km/h, it felt like it was 140.4°F or 60.2°C. Above image shows temperatures, i.e. 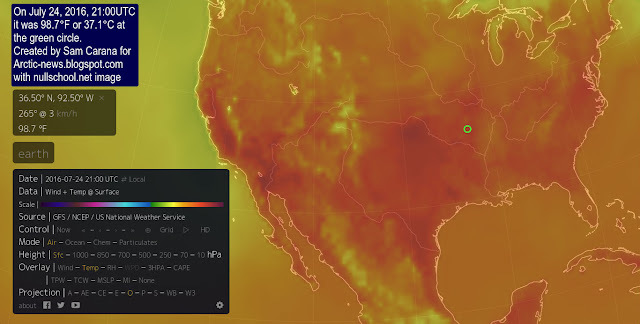 98.7°F or 37.1°C at the green circle. 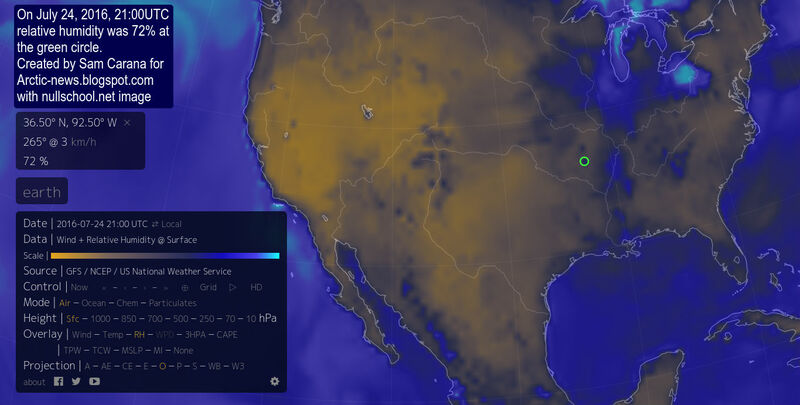 Above image shows that relative humidity was 72% at the green circle. 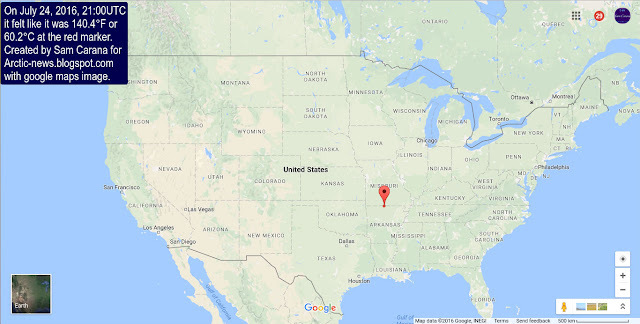 This event occurred at a location on the border of Missouri and Arkansas, just within Missouri, as is also indicated by the red marker above Google Maps image. 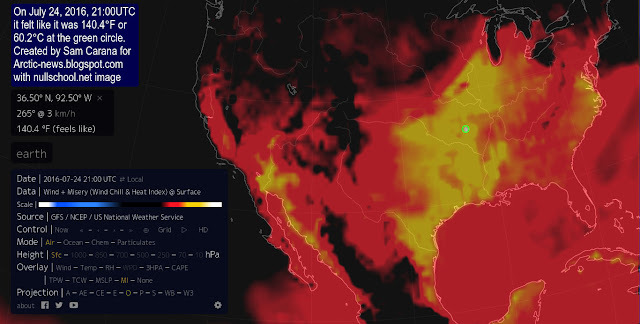 As the EPA animation on the right illustrates, a relatively small rise in average temperature can result in a lot more hot and extremely hot weather. 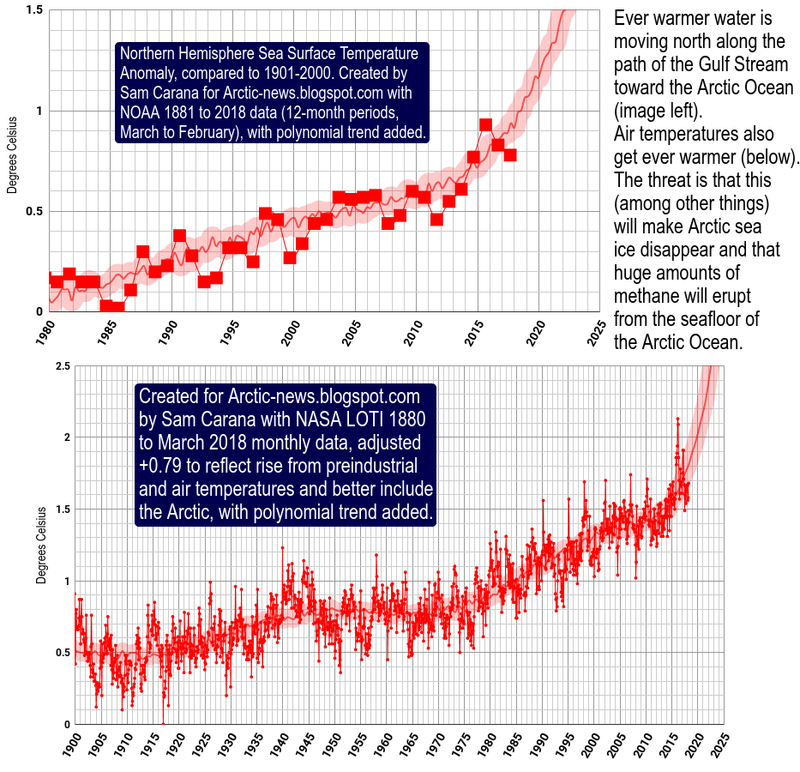 The three images underneath, from the IPCC, show the effect on extreme temperatures when (a) the mean temperature increases, (b) the variance increases, and (c) when both the mean and variance increase for a normal distribution of temperature. 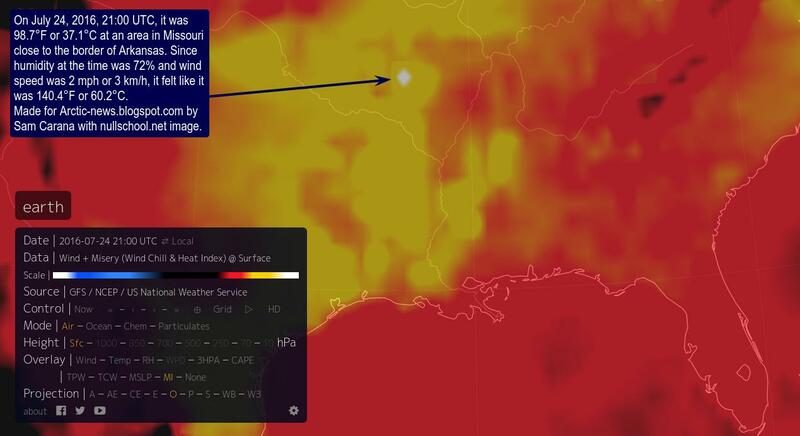 The 'Misery Index' is the perceived air temperature as a combination of wind chill and heat index (which combines air temperature and relative humidity, in shaded areas). As temperatures and humidity levels keep rising, there comes a point where the wind factor no longer matters, in the sense that wind can no longer provide cooling. The thermodynamic wet-bulb temperature is determined by temperature, humidity and pressure (hPa), and it is the lowest temperature that can be achieved by evaporative cooling of a water-wetted ventilated surface. Once the wet-bulb temperature reaches 35°C, one can no longer lose heat by perspiration, even in strong wind, but instead one will start gaining heat from the air beyond a wet-bulb temperature of 35°C. The above combination of 37.1°C at 72% relative humidity at a pressure of 1013 hPa translates into a wet-bulb temperature of 32.43°C. Had humidity risen to 87% while temperature remained at 37.1°C, the wet-bulb temperature would have risen above 35°C. Alternatively, had the temperature risen to 39.9°C while humidity remained at 72%, the wet-bulb temperature would also have risen above 35°C. This goes to show how close the world is to unbearable heat. After all, this event occurred in Missouri, i.e. at some distance from the Equator, implying that, as temperatures and humidity levels keep rising, it could be unbearably hot in many places within a few years time. As discussed in a recent post and illustrated by the image on the right, the world could be 10°C or 18°F warmer in ten years time. 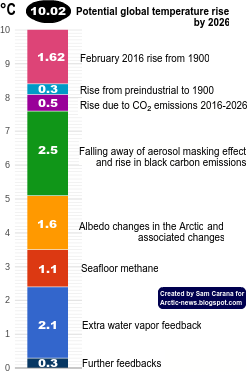 Accordingly, this would lead to numbers of climate-related global deaths in line with the prognosis below. 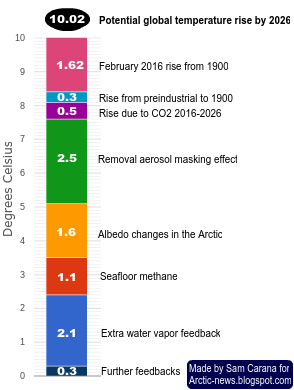 20% of the global warming happened last year. We must declare a global emergency to fight warming. Wet bulb temperatures, soon everyone will be an experty.